Technically speaking, exfoliation is the process of removing dead skin cells. Lack of exfoliation causes your dead skin cells to build up which can cause blemishes and acne or dull, grayish skin. Removing the outermost layer of your skin on a regular basis helps your skin stay healthy, easing both problems with acne and aging. To counteract skin build-up, there are two common methods you can use to exfoliate: physical and chemical. 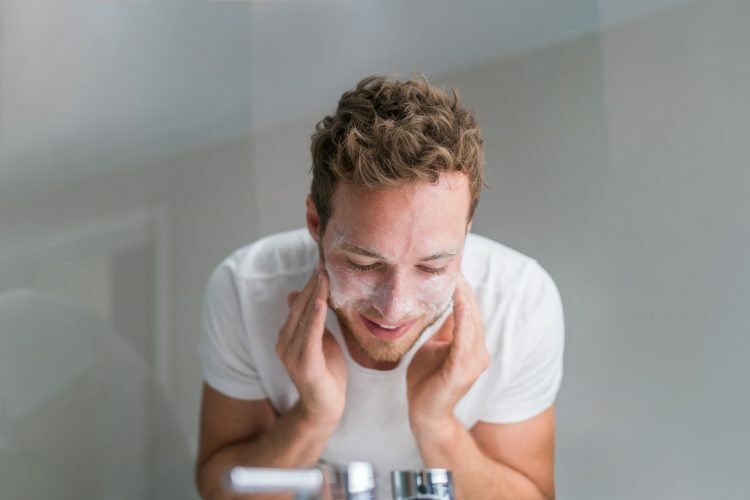 Much as it sounds, physical exfoliation relies on a physical object such as a grainy scrub, washcloth, or a face brush to remove the dead skin. While physical exfoliation has a certain tactile satisfaction of feeling the grains rubbing against your skin, chemical exfoliants such as Alpha hydroxy acids (AHA) or Lactic Acid are usually gentler and more effective. If you do like the ritual of physical exfoliation, limit yourself to 1-2 times a week. Too often will irritate and dry out your skin. Meanwhile many mild chemical exfoliants can be used as part of your daily routine. Do All Skin Types Need to Exfoliate? I love Brickell Men’s Renewing Face Scrub! I use it twice a week. It’s a great scrub that it has Aloe Vera and Vitamin E which I sought out because I have sensitive skin. Lastly, it has a tremendous coffee and green tea smell that really wakes you up when you use it. Every time I use it, I feel as if I’ve really removed any extra dead skin, dirt, and oil from my face. It’s an incredibly rejuvenating experience. Kate Somerville Exfolikate is amazing because it's a two-in-one, with a chemical and an enzymatic exfoliation. The exfoliants are natural and fruit-derived so it gives you amazing results but still is gentle enough to use at home. It helps with dullness, uneven skin tone and pore size! Mario Badescu Botanical Exfoliating Scrub. Back when I lived in New York, I used to get facials there monthly. I love the whole line but had to change it up when I moved from Manhattan to Manhattan Beach, CA. This product is the anchor of my new West Coast routine to counter being in the sun and salt water all the time. Baxter of California Facial Scrub​ is one of my new favorites. The scent on this is out of this world! It’s fresh and nutty and leaves your skin feeling incredibly smooth and soft. They recommend only using this product once or twice a week. Over time with exfoliating your skin will look fresher, more youthful, and radiant, very similar to the inside of an onion as compared to the outside. This is why I think overall, exfoliation is probably the most important part of any skin care routine, and why I spend the most time on it. I use Clinique for Men Scrub at least every other day, and Neostrata Face Cream daily. For a simple nightly routine, ditch the trendy scrubs and face brushes and simply use white washcloths to clean your face and neck. Go to your local market, buying a 24-pack of white washcloths and keeping them by your sink for nightly cleansing. The brushes and scrubs can cause little irritations and scratches on the skin, but the washcloths will be gentle. Use a creamy cleanser, warm water and washcloth, and it will feel like a personal, affordable spa facial massage in your own home. Hopefully this has converted you to the benefits of exfoliation. One word of warning, a little goes a long way. Don't try to make-up for years of not exfoliating in one marathon session or by doubling down and exfoliating several times a day. Be patient and incorporate exfoliation into your regular skincare routine so that you can achieve smoother, healthier skin.